Original compositions by six Pacific Northwest musicians with eclectic palettes and influences. 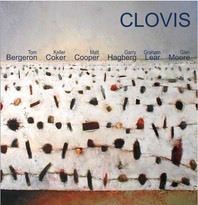 Defying categorization, the album features compositions which range in style from Hagberg's sultry ballad, Blues for Julia, through Coker's Brazilian-tinged Close Enough to Kiss, the Northwest fusion of Cooper's Copland, and a tango by Bergeron, to Moore's classic toe-tapper, Pépé Linque. All of it is anchored and propelled by Lear's powerful and sensitive drumming.